Map showing North American Territorial Boundaries leading up to the American Revolution and the founding of the United States: British claims are indicated in red and pink, while Spanish claims are in orange and yellow. This is a list of historic regions of the United States that existed at some time during the territorial evolution of the United States and its overseas possessions, from the colonial era to the present day. It includes formally organized territories, proposed and failed states, unrecognized breakaway states, international and interstate purchases, cessions, and land grants, and historical military departments and administrative districts. The last section lists informal regions from American vernacular geography known by popular nicknames and linked by geographical, cultural, or economic similarities, some of which are still in use today. For a more complete list of regions and subdivisions of the United States used in modern times, see List of regions of the United States. ✪ Essential Historic Sites Across the U.S. Unlike the land to the east, most of the land west of the Mississippi River was under French or Spanish rule until the first years of the 19th century. Seward's Folly. The controversial purchase of Alaska from Russia in 1867 turned out to be a great deal for the U.S. when the area proved to contain a treasure trove of natural resources. The Oregon Country. The dispute over Oregon, between Britain and the U.S., led to an uneasy, "parallel" governing of the territory for almost 30 years. The Baton Rouge and Mobile Districts of Spanish West Florida, claimed by the United States, spanned parts of three later states. The Spanish province also included part of the present-day state of Florida. The Aroostook War Compromise Lands; 1842, split jointly claimed areas with the U.K. The first State Cessions. The 13 original states ceded their western claims to the federal government, allowing for the creation of the country's first western territories and states. The following are state cessions made during the building of the U.S. The Delaware Wedge, dispute with Pennsylvania settled in 1921. Washington, D.C.; to the Federal Government from Virginia and Maryland, 1790. District of Columbia retrocession; the return to Virginia of the District of Columbia lands which Virginia had originally ceded for its creation, 1847. Greer County, Texas; a disputed county claimed both by Texas and the Federal Government; to Oklahoma Territory, 1896. District of Kentucky; from Virginia; became the Commonwealth of Kentucky, 1792. Illinois County; from Virginia; became Northwest Territory, 1784. District of Maine; from Massachusetts; became the State of Maine, 1820. The Toledo Strip; the object of the nearly bloodless Toledo War between Ohio and Michigan; to Ohio, 1837. Washington District; from North Carolina; became the Southwest Territory, 1790. West Virginia; from Virginia, CSA; separating itself from the Confederacy, declared 1861; admitted to the Union in 1863. The Western Reserve; from Connecticut to the Northwest Territory (Ohio), 1800. The Yazoo Lands; from Georgia to the Mississippi Territory, 1802. The Northwest Territory was a large and (at times) ill-defined territory ceded by Great Britain to the U.S. at the end of the Revolutionary War. British troops still occupied parts of the area well past 1800. The following is a list of the 31 organized U.S. territories that have become states, in the order of the date organized. Northwest Territory (1787–1803), became the state of Ohio, and the Territory of Indiana. Territory South of the River Ohio (also known as the Southwest Territory) (1790–1796) became the State of Tennessee. Territory of Mississippi (1798–1817) became the State of Mississippi and the Territory of Alabama. Territory of Indiana (1800–1816) split into the Illinois Territory, the Michigan Territory, and the State of Indiana. Territory of Orleans (1804–1812) became the State of Louisiana. Territory of Michigan (1805–1837) became State of Michigan and the Territory of Wisconsin. Territory of Louisiana (1805–1812) (preceded by the District of Louisiana), then renamed the Territory of Missouri. Territory of Illinois (1809–1818) split into the State of Illinois and additions to the Michigan Territory. Territory of Missouri (1812–1821) became the State of Missouri and Unorganized Territory (the eastern part of which was attached to the Territory of Michigan in 1834). Territory of Alabama (1817–1819) became State of Alabama. Territory of Arkansaw (1819–1836) became the State of Arkansas, additions to the unorganized territory of the original Louisiana Purchase, and the unorganized Indian Territory (which eventually spawned Indian Territory, Oklahoma Territory and No Man's Land). Territory of Florida (1822–1845) became the State of Florida. Territory of Wisconsin (1836–1848) split into the State of Wisconsin, the Iowa Territory and Unorganized Territory. Territory of Iowa (1838–1846) split into the State of Iowa and unorganized territory of the original Louisiana Purchase. Territory of Oregon (1848–1859) preceded by the unrecognized Oregon Country; split into the State of Oregon and Washington Territory. Territory of Minnesota (1849–1858) preceded (mostly) by unorganized territory of the original Louisiana Purchase; split into the State of Minnesota and unorganized territory of the original Louisiana Purchase. Territory of New Mexico (1850–1912) preceded by Nuevo Mexico; (the southern part was known as the Arizona Territory (CSA) (1861–1864) by the Confederate States of America); split into the Arizona Territory (USA) and State of New Mexico (USA). Territory of Utah (1850–1896) preceded by Alta California and the unrecognized State of Deseret; split into the State of Utah, the Nevada Territory, additions to the Colorado Territory and additions to the Wyoming Territory. Territory of Washington (1853–1889) became the State of Washington and additions to the Idaho Territory. Territory of Kansas (1854–1861) preceded by unorganized territory of the original Louisiana Purchase; split into the State of Kansas and additions to the Colorado Territory. Territory of Nebraska (1854–1867) preceded by unorganized territory of the original Louisiana Purchase; split into the State of Nebraska, the Dakota Territory, additions to the Idaho Territory and additions to the Colorado Territory. Territory of Nevada (1861–1864) preceded by the Utah Territory and the unrecognized State of Deseret; became the State of Nevada. Territory of Dakota (1861–1889) became the State of North Dakota, the State of South Dakota, additions to the Idaho Territory and additions to the Wyoming Territory. Territory of Arizona (1863–1912) became the State of Arizona and an addition to the State of Nevada. Territory of Idaho (1863–1890) preceded by parts of the territories of: Washington, Dakota, and Nebraska; became the State of Idaho, the Montana Territory, additions to the Dakota Territory and additions to the Wyoming Territory. Territory of Montana (1864–1889) became the State of Montana. Territory of Wyoming (1868–1890) preceded by parts of the territories of: Dakota, Utah and Idaho; became the State of Wyoming. Territory of Oklahoma (1890–1907) (preceded by the unorganized Indian Territory (1834–1907) and the Neutral Strip; became the State of Oklahoma. Territory of Hawaii (1898–1959) preceded by the Republic of Hawaii; became the State of Hawaii. 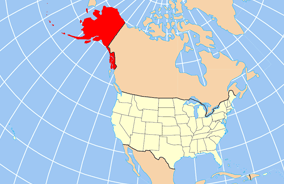 Territory of Alaska (1912–1959) (preceded by the Department of Alaska and the District of Alaska); became the State of Alaska. The following are land grants, cessions, defined districts (official or otherwise) or named settlements made within an area that was already part of a U.S. state or territory that did not involve international treaties or Native American cessions or land purchases. Cumberland District, North Carolina (also called the District of Miro); Tennessee. District of Louisiana; Missouri, Kansas, Iowa, Nebraska, Minnesota, North and South Dakota, Montana, Arkansas, Oklahoma, Colorado, Wyoming; renamed Missouri Territory in 1812. Military Tract of 1812; Illinois, Michigan, Arkansas, Missouri. Ohio Country; parts of Ohio, Indiana, Pennsylvania, West Virginia. District of Alaska; renamed the Alaska Territory in 1912. Oklahoma Territory and Indian Territory, along with No Man's Land (also known as the Oklahoma Panhandle). The division of the two territories is shown with a heavy purple line. Together, these three areas would become the State of Oklahoma in 1907. These entities were sometimes the only governmental authority in the listed areas, although they often co-existed with civil governments in scarcely populated states and territories. Civilian administered "military" tracts, districts, departments, etc., will be listed elsewhere. Department of the Missouri (1861–1865) Missouri, Arkansas, Illinois, part of Kentucky, and later Kansas; re-configured in 1865 as part of the Division of the Missouri. Division of the Missouri (1865–1891). Department of Dakota (1866–1911) Minnesota, Montana, North Dakota, and parts of Idaho, South Dakota and the Yellowstone portion of Wyoming. Department of the Missouri (1865–1891) Arkansas, Kansas, Missouri, Indian Territory, and Territory of Oklahoma. Department of the Platte (1866–1898) Iowa, Nebraska, Colorado, Dakota Territory, Utah Territory, Wyoming (except Yellowstone), and a portion of Idaho. Department of Texas (1871–1880) (originally part of the Department of the Gulf) Texas after 1865. Department of New Mexico (1854–65) New Mexico Territory; previously part of the District of California and the Department of the West. Pacific Division (1848–1853) lands won in the Mexican–American War; became the original Department of the Pacific in 1853. Military Department 10 (1848–1851) California. Military Department 11 (1848–1851) Oregon Territory. Department of the Pacific (1853–1858; and 1861–1865); separated into the Department of California and the Department of Oregon in 1858. District of Oregon (1853–1858) Washington Territory, Oregon Territory. District of California (headquarters at San Francisco, co-located with Department of the Pacific). Independent command from Department from (July 1, 1864 – July 27, 1865); those parts of California not in other districts. District of Southern California (September 25, 1861 – July 27, 1865); Counties of Southern California (southward from San Luis Obispo and Tulare Counties). District of Humboldt (December 12, 1861 – July 27, 1865); Del Norte, Humboldt, Klamath, Mendocino Counties of California. District of Utah (August 6, 1862 – July 27, 1865); Utah Territory, Nevada Territory, later State of Nevada. The Department of California (1858–1861) comprised the southern part of the Department of the Pacific: California, Nevada, and southern part of Oregon Territory; merged into the Department of the Pacific as the District of California. The Department of Oregon (1858–1861) comprised the northern part of the Department of the Pacific: Washington Territory and Oregon Territory. Military Division of the Pacific (1865–1891). Department of Alaska (1868–1884) became the civilian-ruled District of Alaska. Department of Arizona (1865–1891) Arizona Territory; included New Mexico Territory after 1885. Department of the Columbia (1865–1891) Oregon, Washington Territory, part of Idaho Territory, and Alaska after 1870. District of Oregon (1865–1867) Washington Territory, Oregon Territory and Idaho Territory. New Department of California (1865–1891) California, Nevada Territory, Arizona Territory, and part of New Mexico Territory. Post-Civil War Military Districts were set up to aid in the repatriation process of the southern states during "Reconstruction". Department of the Gulf (1862–1865; created by the U.S. for the Civil War) Mississippi, Alabama, Louisiana, and Texas. Trans-Mississippi (or Trans-Mississippi Department; CSA) (1862–1865) Formerly "Military Dept. 2"; Missouri, Arkansas, Texas, Indian Territory (now Oklahoma), Kansas, and Louisiana west of the Mississippi River. Department of the West (1853–1861) all U.S. lands between the Mississippi River and the Military District of the Pacific not included in other Districts or Departments. The Milk River and Poplar River cessions to the United Kingdom, in the Treaty of 1818. Commonwealth of the Philippines, to Republic of the Philippines (1946). Chamizal, Texas, to Mexico (1964). Rio Rico, Texas (Horcón Tract) to Mexico (1977). Panama Canal Zone, to Panama (1999). Confederate States of America (CSA) – see map. State of Scott, seceded from Tennessee and became a Union enclave. Republic of California (also known as the "Bear Flag Republic"); June 14, 1846 – July 9, 1846, thereafter becoming the unorganized "Territory of California"
Flag of the Kingdom of Hawai'i, 1894-1898. The proposed State of Superior. The red areas show the counties of the Upper Peninsula that are generally accepted as being part of the proposed state. The pink areas show the counties of the "expanded" proposal. See also: Category:Proposed states of the United States. Proposed State of Jefferson (Rocky Mountains), 1859, was an attempt to legitimize the Jefferson Territory, stalled by the Civil War; failed proposal. Proposed State of Jefferson (Texas), 1870 and 1915 statehood proposals both died in committee. Territory of Colorado (California) 1860, stalled in Congress by the Civil War; a proposal to form a territory from Southern California following a successful popular referendum. Comancheria; area inhabited and intermittently controlled by the Comanche and their allies. Dinétah; the claimed original Navajo homeland. Republic of Lakotah; the proposed Sioux upper Midwestern mega-state. Lenapehoking; would be named for the Delaware or Lenilenape Indians. Belts are loosely defined sub-regions found throughout the United States that are named for a perceived commonality among the included areas, which is often related to the region's economy or climate. Mormon Corridor or "Jello Belt"
^ "Luisiana". Artifacts.org. Retrieved 2012-09-17. ^ Heidler, David Stephen; Heidler, Jeanne T.; Coles, David J.; Encyclopedia of the American Civil War: A Political, Social, and Military History; W. W. Norton & Company; New York; 2000; p. 590. ^ a b "A Century of Lawmaking for a New Nation: U.S. Congressional Documents and Debates, 1774 - 1875". memory.loc.gov. Retrieved 8 April 2018. Wikimedia Commons has media related to Historical regions of the United States.